This is an ancient human social construct that once was common in this land. We called it a community. We lived among our villagers, depending on them for what we needed. If we had a problem, we did not discuss it over the phone with someone in Bhubaneswar. We went to a neighbor. We acquired food from farmers. We listened to music in groups, in churches or on front porches. We danced. We participated. Even when there was no money in it. Community is our native state. You play hardest for a hometown crowd. You become your best self. You know joy. This is not a guess; there is evidence. The scholars who study social well-being can put it on charts and graphs. In the last 30 years our material wealth has increased in this country, but our self-described happiness has steadily declined. Elsewhere, the people who consider themselves very happy are not in the very poorest nations, as you might guess, nor in the very richest. The winners are Mexico, Ireland, Puerto Rico, the kinds of places we identify with extended family, noisy villages, a lot of dancing. The happiest people are the ones with the most community. Over and over again, the deepest joys we find are when we’re sharing things with other people. My best memories always involve other people, usually some form of shared experience. When am I happiest? I’m happiest when I’m surrounded by people I care about doing something that we collectively enjoy. The less I do of that, the sadder and worse off I am. This is a ten minute film that will leave you thinking long after it’s over. What really matters to you? There’s an easy way to tell. Based on my stubs, I apparently value the IRS. Actually, I apparently value my children, good food, and playing games with my friends, as my most recent significant expenditures were for my children’s ballet recital, a larger-than-average grocery bill weighted down with fresh foods, and some costs for my trip to Gencon with friends. What do you value? I’ll bet your checkbook reveals the truth. Power of Art is a BBC documentary series with each episode focusing on one artist, one specific work by that artist, and the cultural impact of that artist and that work. The series is exquisitely done and often stunning when you see the incredible impact of art on our world. My favorite episode (unsurprisingly) is the one on Vincent van Gogh, which I was able to watch again this week. You can watch all of the parts by following these links: one, two, three, four, five, and six. 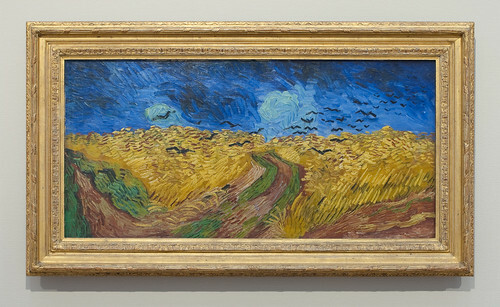 The painting focused on in the above documentary is the breathtaking Wheatfield with Crows, one of van Gogh’s final paintings (and my current computer desktop wallpaper). There’s something beautiful and foreboding in this picture. It’s much the way I feel when an emormous thunderstorm is building in the west and I can see the birds circling uncertainly. The air pressure is fluctuating, with warm air on my skin mixing with just a hint of cool in the swirling breeze. There’s anticipation, there’s beauty, and there’s a bit of worry, too. Thanks to Pachango for the image. Lao Tzu, the founder of taoism, lays out some of his core principles here. Gentleness. Frugality. Humility. Three strong principles to live by. Modern life is full of traps and perils and inconveniences. Rather than being afraid of everything, they’re all a reason to go out there and live our lives as boldly as possible. We can either hide in our homes and be afraid or go out there and change the world. There are dangers either way, but one path pushes us towards a greater life while the other just folds in on itself. Sometimes, I stumble at playing the piano because my fingers are big and I accidentally hit two keys at once. I get frustrated. This video shows me how small my problem really is and also shows me exactly what’s possible. There is always more money. There isn’t always more of the things we really need. I don’t really need to say anything, do I? Just listen.